Some 1,500 athletes, along with their friends, families and support crews, began gathering at the race village before dawn to prepare for the 6:35am flag-off.Even at that early hour, the race village was already buzzing for one of the most eagerly anticipated events on the annual multisports calendar. Set amid a backdrop of the F1 Pit Building, the Singapore Flyer, Marina Bay and the stunning city skyline, it’s easy to see why the MetaSprint Duathlon has such a special feel. The calibre of athletes was pretty special too. Fresh off victory in the previous weekend’s Powerman Malaysia, Eberhardt was the clear favourite in the women’s elite race, which kicked off the morning’s action. But the presence of local Ironman superstar Ling Er Choo, making a rare foray into sprint-distance racing, as well as the talented Middleditch and Yong sisters, meant there was plenty of intrigue on the start line. The elite women had an 8-minutes-and-17-seconds head start on their male counterparts as part of the Champion of Champions element to the MetaSprint Series. The handicap, or Equaliser, is calculated on the gap between the winning men and women in the previous three years’ events. After being caught by the lead men in the closing stages of the MetaSprint Aquathlon last month, Eberhardt had hinted that she was going to turn the tables in the Duathlon. The Hungarian flew out of the gate, covering the opening leg of the 3km run-18km bike-3km run race in a time of 10:32, a pace that only the younger of the Middleditch sisters, Emma, could match. The Yong twins Vanessa and Valerie were next into T1 some 15 seconds behind, but Choo had left herself a lot to do after running about a minute slower than Eberhardt. Onto the bike leg, and the 35-year-old Eberhardt simply powered away from the rest of the field, putting more than a minute into Middleditch and the Yongs on just the first of the three 6km loops the racers faced. Eberhardt covered the final two laps even faster and came into T2 with a lead of nearly 2 minutes. That gap was to Choo, who had shot through the field to build herself a similar gap over Middleditch and the rest. The second 3km run was a formality for Eberhardt and she duly crossed the line a comfortable winner in a time of 54 minutes and 9 seconds. Choo could also afford to take her foot of the gas in claiming the runners-up spot, but the third-placed finisher Emma Middleditch certainly didn’t ease up, the teenager being the only runner to break 11 minutes for the final leg. Interestingly, all three of the leading ladies finished ahead of the elite men, meaning Eberhardt’s confidence about winning the Champion of Champions crown was well justified. But she admitted post-race that the odds were stacked in her favour. “With a more than 8 minutes advantage on such a short course against the men’s field, it would have been a surprise for me had I lost the lead position overall,” she said. Still, Eberhardt was delighted to have won both titles and really appreciated the shorter race distance given her recent schedule, which saw Sunday’s duathlon sandwiched between Powerman Malaysia and IRONMAN 70.3 Davao. “As a long-course triathlete it’s always a nice opportunity for me to take part and support local events, such as the MetaSport Sprint Series and see some familiar faces,” said Eberhardt, who helps coach a MetaSport track session on Tuesdays. But she admitted to feeling a bit fatigued on Sunday. “We did not ease off my training after Powerman as my main focus is the upcoming IRONMAN 70.3 in Davao, and so after a Saturday long run yesterday I had to deal with heavy legs today,” she said. When Davao is done this weekend, Eberhardt said she’ll then be looking forward to the finale of the MetaSprint Series on April 15, where she’ll try to clinch the series titles. The start line for the men’s elite race in the MetaSprint Duathlon featured a who’s who of the local triathlon scene, with the previous two MetaSprint Duathlon winners James Middleditch and David Watson joined by the likes of Arnaud Selukov, Blakie, Nikolai Jenkins, Mark Jansen and last month’s MetaSprint Aquathlon champ Tim Cosulich. It was Watson who set the pace, the 2016 winner leading a strung-out line of runners into T1 with a 9:32 split. Ali King, Cosulich and Alexandre Delort were his nearest challengers, with Blakie well within striking distance too. Onto the bike and after the first of the three laps it became apparent that Blakie was the fastest cyclist on course as he had moved past the fastest runners and built a small lead. He continued to pull away over the final 12km of the bike leg, and rolled into T2 with a lead of 25 seconds over the next man Jenkins, with Watson a further 11 seconds behind in third.With the next group of riders hitting transition some 30 seconds further back, it looked like a three-man shoot-out for the title. Watson proved to be the fastest of the trio on the final run, but the lead Blakie had built on the bike proved to be decisive and the Briton held on for a deserved win, crossing the line in a time of 49:46. Watson stormed home 13 seconds later, with Jenkins well back in third. While the elite athletes grab the headlines, the main focus of the MetaSprint Series is about building the sport of triathlon by providing a competitive but friendly series of events for people of all ages, experience and abilities to give swim-bike-run a go. The annual series features an Aquathlon in February, a Duathlon in March and concludes with a Triathlon in April. As well as providing veteran athletes with some early-season sharpening, the concept provides complete rookies the stepping-stones to be able to go from newbie to triathlete in three short months. It really is “a fun way to be a triathlete” as the series tagline proclaims and the evidence of its success was the number of multisports newcomers that took part in the 2018 edition of the MetaSprint Duathlon on Sunday. Among them was the youngest participant, three-year-old Jeremiah Ang Shao Teng, who took part in the Kids Super Scoot, a 500-metre scooter dash for the under eights. At the other end of the age scale was sprint-distance athlete Kogi Oberoi, who at 75 years young, was the oldest participant. While most of the 1,500 plus participants competed over the same Sprint Distance that the elites and Oberoi covered, the shorter Discovery Distance category with its 1.5km run-12km bike-1.5km run format also attracted a sizeable field. The male champion over the Discovery Distance proved to be Jared Wong, with a time of 35:10. The runner-up was Loy Mun Ho, with Lance Tan the third-fastest man. The mantle of fastest Discovery female went to Jillian See, followed by Katie Draper and Victoria Offland. The Youths (12-15 years) and Kids (8-11 years) are a huge part of the MetaSprint Series, with the former also competing over the Discovery Distance. Many of the current top local adult triathletes cut their teeth in the MetaSprint Series. So look out for the names Darrell Zhuo Wen Tan, William Roue and Julian Lee, who were the fastest three male Youths on Sunday. Zhou was a comfortable winner in a time of 36:46, but Roue had to chase down Lee on the final 1.5km run to get the runner’s-up spot. Third-over-the-line Lee was incidentally competing in the younger 12-13 sub-category. Among the Youth girls, the familiar name of Enola de Smet was called first over the line. She put in a dominating performance to take the title in a time of 39:26, with Ria Nakahara and Bella Schroff in second and third respectively. The Kids were next up, over 150 of them! Julius Groenewegen proved to be the fastest boy, winning a tight race in with Muhammad Akid Muhammad Najib to take the top spot on the podium. Daniel Louw wasn’t too far back in third. The girls’ race was a thriller, with Diana Veres claiming the crown thanks to storming final run. Her winning time was 24:43, with the runner-up Eugenie Van Wersch just 7 seconds back. Tegan Sweeney took third place. 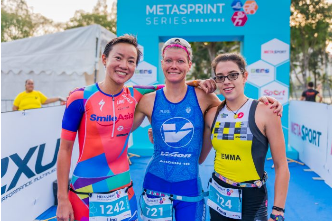 The 2018 MetaSprint Series concludes on April 15 with the MetaSprint Triathlon at the East Coast Park. Sprint, Discovery, Youths and Kids distance races are again on offer, and the overall series titles are also up for grabs. The MetaSprint Series overall rankings use a system where points earned in the Duathlon OR Aquathlon are added to points from the Triathlon. This means that the swim-runners and the bike-runners are equally matched going into the Triathlon. Registration for the MetaSprint Triathlon is still open. Go to www.metasprintseries.com to sign up and note that there is a price increase on March 22. 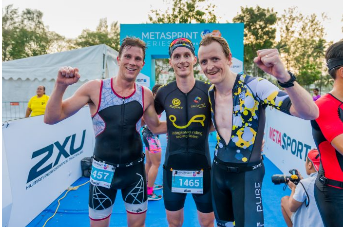 For those looking for a confidence booster or some fine tuning ahead of the Triathlon, MetaSprint Series organisers MetaSport are putting on special training clinics. Visit www.metasprintseries.com/training-clinics/ for details. MetaSport have also arranged for a fleet of rental bikes for those that want to take part but don’t have a bike. Visit www.metasprintseries.com/bike-rental/ to take advantage of that offer. This article was also published on www.metasprintseries.com.